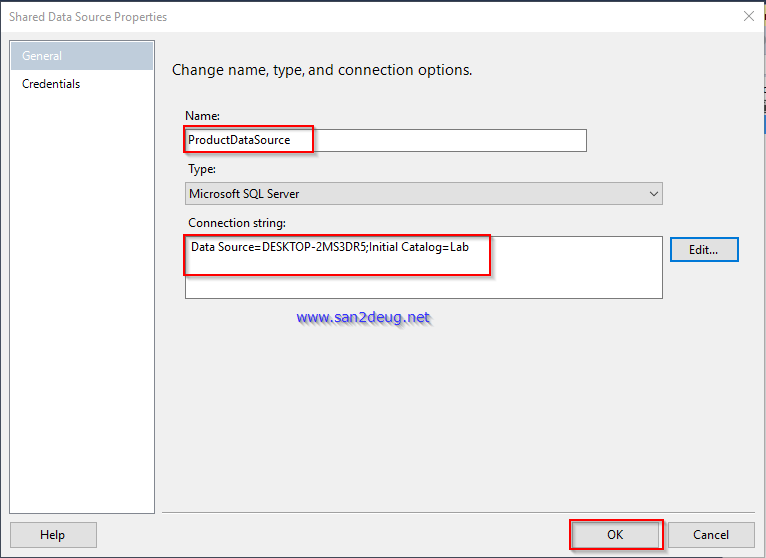 In this article, we will discuss how we can create a Shared Data Sources in SQL Server Reporting Services 2016. 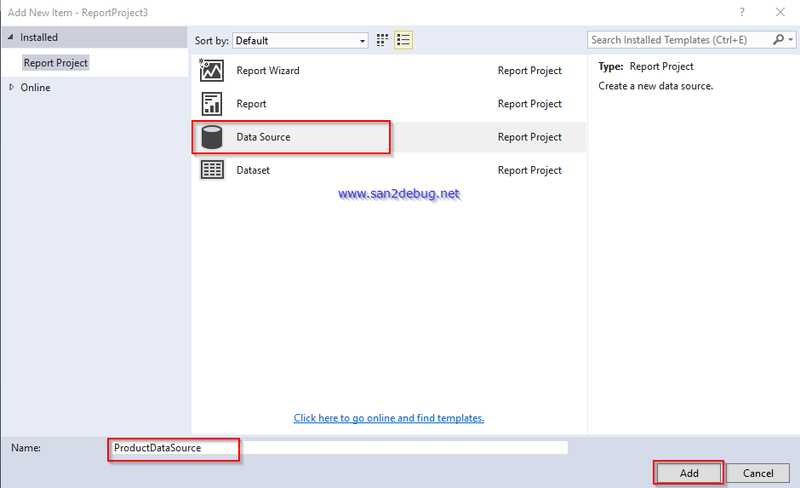 We have already discussed how to create a Matrix report , using Report wizard, how to deploy SSRS Report into a Reporting Server and how to run a Report Application in my previous articles. In this article, we will discuss how we can create a Shared Data Sources in SQL Server Reporting Services 2016. 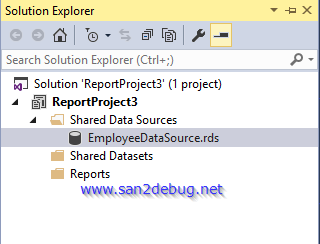 We have already discussed how to create a Matrix report, using Report wizard, how to deploy SSRS Reports into a Reporting Server and how to run a Report Application in my previous articles. 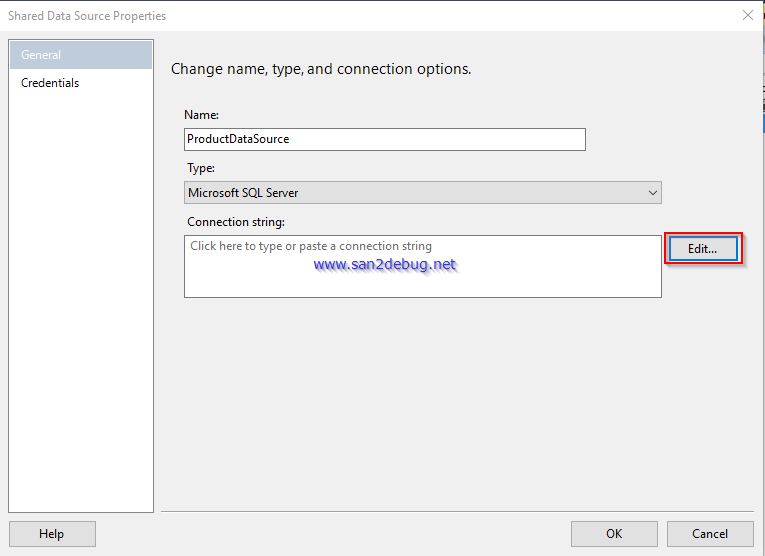 We can learn how to create, modify and delete shared data sources in SSRS. If you want to learn SSRS series, you can refer to the links given below. In this article, we will see the following. What are Shared Data Sources? Shared Data Source is a collection of the data source, which can be used with multiple reports, report models and subscriptions etc. 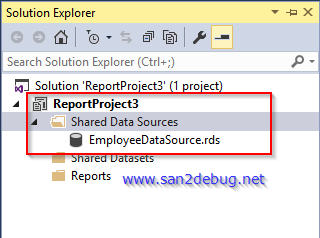 We can create a Shared Date Source and run it on Reporting Service into a Report Server. 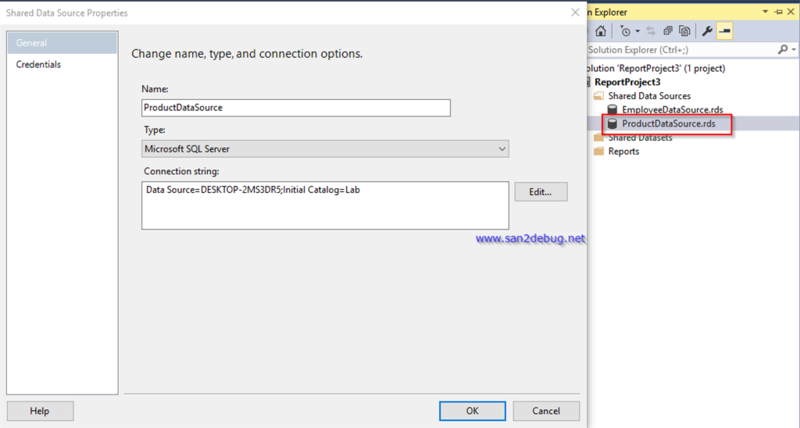 We should have some basic knowledge in SQL Server query and Visual Studio tool to create SSRS Reports, using Visual Studio 2015. 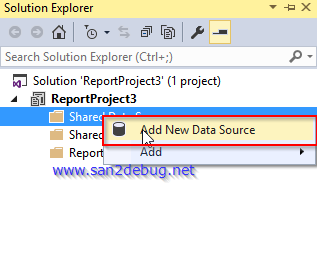 After creating SSRS Project successfully, go to the Shared Data Source folder, right-click Shared Data Source folder, point to Add New Data Source and click Add New Data Source. Shared Data Source Window will open and click Edit button. 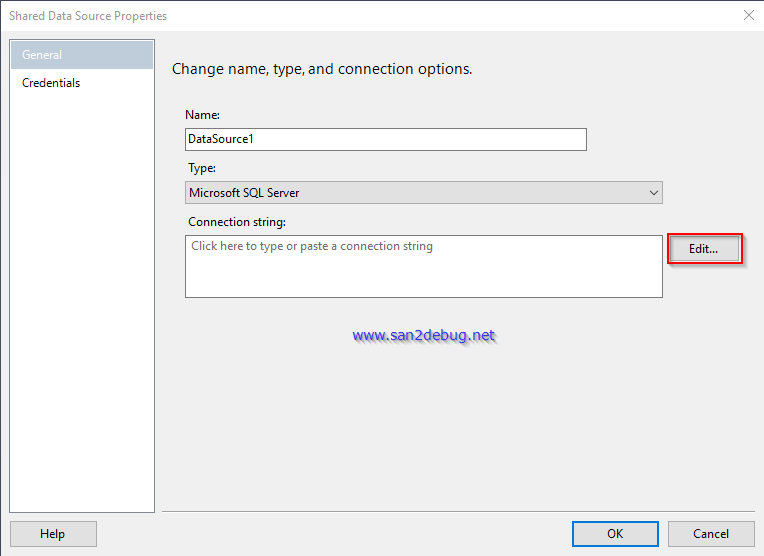 Connection Properties Window will open, where you are required to type the Server name, select the Authentication, user name, password, select or enter a database name and finally, you can check the database connection succeed, followed by clicking the Test Connection button. Now, click OK button. Shared Data Source Window will open. 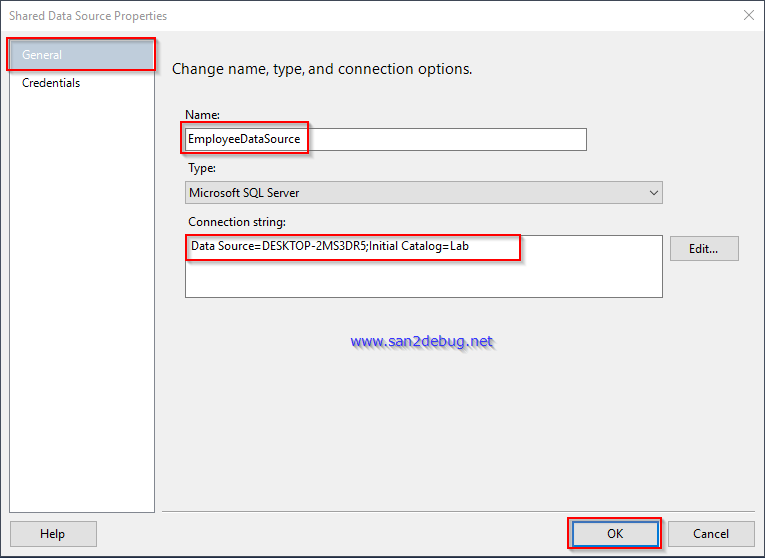 Select the new data source, connection string and click OK button. After creating a new data source file, you can see Shared Data Source folder structure, as shown below. Go to Shared Data Source folder, right-click Shared Data Source folder and point to Add -> New Item, followed by clicking the New Item. Add New Item Window will open and choose the Data Source template. Now, type the Data Source name as ProductDataSource and click Add button. 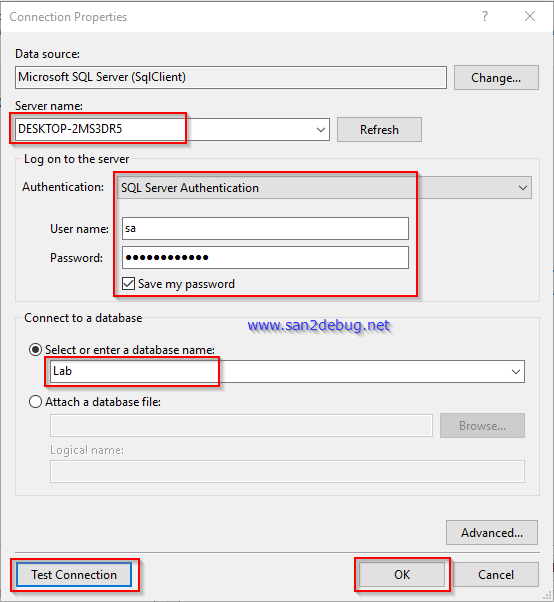 Connection Properties Window will open, type the Server name, select the Authentication, user name, password, select or enter a database name and finally, you can check the database connection succeed, followed by clicking the Test Connection button. Now, click OK button. 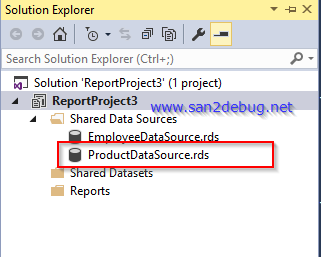 Go to Shared Data Source folder, click the ProductDataSource.rds data source name. Now, Shared Data Source Window will open, as shown below. Now, you can change the name, type, connection string and data source credentials. 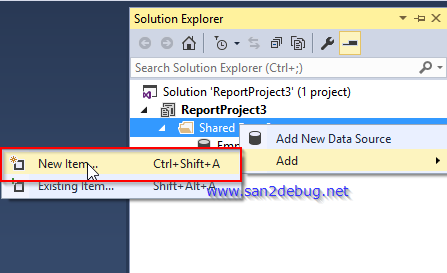 Go to Shared Data Source folder, right-click the ProductDataSource.rds and point to Delete context menu item, followed by clicking delete the item. 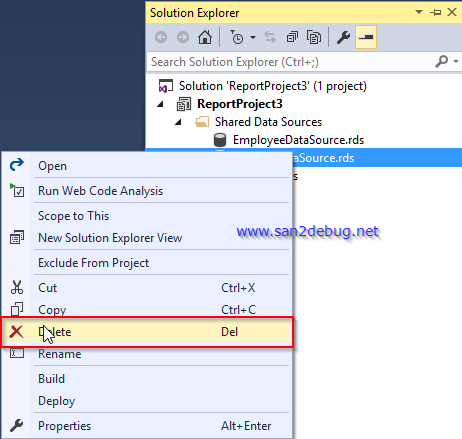 Microsoft Visual Studio Window will open and prompt delete confirmation option. Click OK button to delete the data source file, else click Cancel button to cancel the delete process, as shown below. After deleting the ProductDataSource.rds file, you can see Shared Data Source folder structure, as shown below. 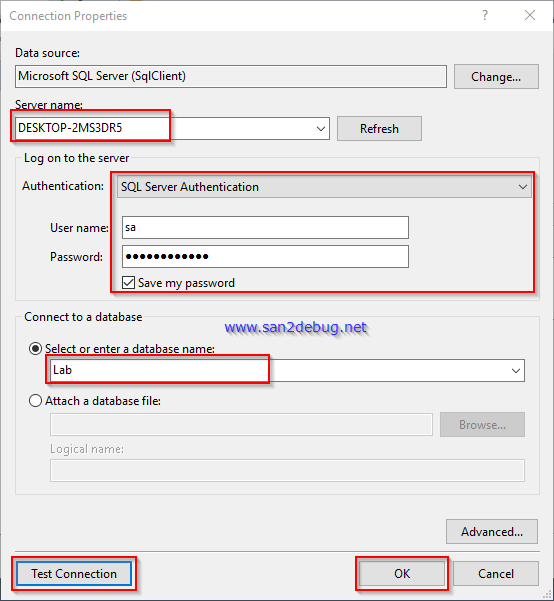 I hope you understood how we can create a Shared Data Source in SQL Server Reporting Services 2016, how to create a Shared Data Source, using Report wizard, how to create a Shared Data Source without using the Report wizard, how to modify Shared Data Source and how to delete Shared Data Sources. I have covered all the required things. If you find anything which I missed in this article, please let me know. Please share your valuable feedback or comments and suggestions to improve the future articles.